It's been a long time since I wrote here. Being a dad again. My daughter Maud is The Best (biased dad, me?) but, aged 52, I'd forgotten how small people take up every available minute of free time. Having no time meant that last week's rare foray into the surf was super-sweet. I even remembered how to ride a wave. Just. Pleased to get this obit of Surfer magazine founder John Severson away in The Times. Severson was a sharp, charismatic and talented guy; good with words and images; a fine surfer and a family man. He figured out something that many of us would envy: how to make money when young, then quit a conventional job and live life on his terms - in Hawaii, surfing and painting. The photo here, of Greg Noll at Pipeline, is one of his most famous. Thanks, as ever, to Matt Warshaw for his help. For the past four or five years, I've been involved in some corporate copywriting for two very large organisations. This work came to an end on Wednesday this week. One of the entities had taken its outsourced writing in-house a few months ago, the other decided it wanted a different approach to its copywriting needs as March came to a close. It therefore bid adieu to the agency that had, in turn, contracted me. Finding out that this throughput of work was coming to an end might have been stressful. After all, it helped pay the bills. But life is curious. No sooner had I been told the gig would be ending, than a ton of other work landed - interesting, rewarding, exciting work with pleasant people. Already our new office in Lima is blossoming. The admonition asked me to rewrite that phrase. The reason? "Law firm offices do not blossom". I'm halfway through William Finnegan's Barbarian Days. Yes, this book came out about two years ago. I got there in the end. But not to the end. Yet. But I will finish this book. It's what scribes of back-cover blurb call "a compulsive read". Why? Because of the blend of tone (down to earth, unforced), credibility (Finnegan put the hours in, both to writing and surfing) and style (sick of "sick" as the adjective de rigueur in surfing? Unstoked by people who are stoked? In need of something that might really be "epic", rather than a stale imitation? Finnegan is the answer). The book is arguably the best map of surfing's evolution from the early 60s to the present day yet written. Finnegan was there at the beginning, in epicentres like Hawaii and California (initially riding longboards). He was swept up by the shortboard revolution before heading off on The Search ahead of its colonisation as a marketing term. He got to ride Tavarua before it became a tourist resort (have they now killed the snakes there, to make it user-friendly, I wonder? ), spent time in the Lucky Country and snagged waves in Bali, various African countries and Madeira, as well as a whole load of places in between. My trajectory through life mirrors Finnegan's not in the sense that I ever became anything to write home about as a surfer, but thanks to the places we visited. I imagine this is the same for many surfers. Of whatever level - hotshot, kook, somewhere in between - the chances are that we'll visit the same places, at some time or another. Another similarity is that Finnegan read constantly on his trips here and there. With some 240 pages of Barbarian Days to go, I sense that the book doubles as a memoir not just of a surfing life but of a writer's, too. And like Finnegan, everywhere I went I had a book on the go; to read (and learn) was as important as to see (and surf). We also both like Joyce, although unlike Finnegan I haven't read Finnegans Wake. Thanks to his excellent book, I feel it's time to revisit the Irish master - and to find the time, so elusive thanks to work and all the things that add up to life, for surfing again. Pleased to get a couple of pieces away in The Times recently - one in the Sport section last Saturday on surfing and the Olympics, the other an obituary on the legendary Chris Tyler, in the paper today. Always an honour to write obits, especially this one of Cass and Essex's dad. 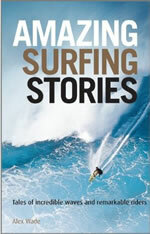 Agatha Christie’s heroine Anne Bedingfield, in The Man in the Brown Suit, said of surfing: “you are either vigorously cursing or idiotically pleased with yourself”. Christie herself was keen on the sport, and one of the entries in Alex Wade’s Amazing Surfing Stories playfully speculates that when she disappeared for eleven days in December 1926 she was in fact riding the waves at Bridlington, on the Yorkshire coast. Surfing offers danger, communion with nature and the possibility of high-speed grace, all without the hassle and expense of ski lifts, and, as with many “extreme” sports, discussion among its enthusiasts can oscillate between self-satisfation and incomprehensibility. It is therefore especially pleasing that Wade’s second book on the subject, following Surf Nation (2008), is so accessible and diverting. “people in car crashes don’t stop driving”. by, and the feeling is eerily akin to that of surfing itself. Wade achieves a subtly different moral note in each piece, and even those dealing with death or suicide feel bound by a spirit of generosity and the value of saying “yes”. book went to press before an exuberant reference to Lance Armstrong could be cut. Fortunately these detract no more than do bumps and grazes after a day among the waves. Wandered into Soho this afternoon with Harry in search of camera shops (yes). Checked out The Photographer's Gallery and loved the Bert Hardy exhibition. Meandered here and there, each step a gesture of defiance to my hangover, and then, in an attempt to find a particular camera shop, found that we'd retraced our steps and were in Bury Place, near the British Museum. In Bury Place there is, of course, a fine bookshop - no less a place than the London Review book shop. Never able to resist bookshops, especially ones that sell proper books, I declared to Harry and my hangover that we would enter. I had in mind buying a collection of Flann O'Brien's short stories for Caroline, but once inside couldn't help but wonder: would they have Flack's Last Shift in stock? I approached the table of new hardback fiction and scanned its offerings. Flack was not among them. C'est la vie, I thought, because I always think in French whenever something I've written is not where I'd like it to be. On y va, I said to myself, because it's the only other French term I know. Soon enough, I'd found some O'Brien short stories and also spotted Astragal by Albertine Sarrazin. I'd heard of this book a long time ago and was happy to add it to O'Brien. And then, as I approached the counter, what did I see but Flack's Last Shift on the very same hardback fiction table I'd scoured earlier, but atop a display tower, beaming proudly toward any and all-comers? Needless to say my hangover apologised for making me so blind and I mentioned that I'd written the book to the booksellers, Claire and Charlie. I offered to sign it, too, assuring Claire that "I really am me". How could she doubt such a concrete demonstration of selfhood? No one could, it would be as futile as trying to fire a cannonball from a spud gun. And so I signed the book, and asked Harry to capture Flack at the top of the stack. It's been a great 24 hours or so in London. Tomorrow I'm heading to Monocle 24 to chat about Flack, and then it's back to Wiltshire to see Caroline and the two beauties pictured here. The connection between calf injuries and a writer's ability to produce a half-decent novel is so well-known that I need not restate it here. Suffice to say that picking up a calf injury in Tuesday night's footy struck me as a sign, or, if you like, an omen - or maybe even a harbinger - of doom. Yes, I thought, my novel Flack's Last Shift - published today - is surely The Worst Book In The World. This feeling was accentuated by my performance on the field, itself rendered anonymous not just by a knackered calf, knackered body, old age and general lack of ability but by food poisoning on Monday night. "How did you think Alex played tonight?" said a player, after the game. "Don't be a fool - he wasn't there," said the other. "Yes he was! But then again, hang on, you're right - he wasn't." In vain did I stand before them, nursing my calf. Having achieved such real, genuine and meaningful anonymity, it was with mounting apprehension, not to say invisibility, that I got to today, this very day, the day Flack's Last Shift is in bookshops and on Amazon. And then, out of the blue, Al Mackinnon turned up. Catching up with one of life's good people was long overdue and Al generously revealed a lifetime of photographic tips to my son Harry, as I battled to finish all my work so that I can set off from Cornwall in about an hour and enjoy the launch party for Flack tonight at a do in Soho. The joy of being a law firm outside the institutionalised City legal elite is that you can relax and kick out a bit. That’s why I like the style of Soho’s Simons Muirhead & Burton, which tonight hosts the launch of legal thriller Flack’s Last Shift (Blue Mark Books) by lawyer and writer Alex Wade. The story focuses on the behind-the-scenes intrigues and chicanery of life as a top newspaper’s “night lawyer”. It’s like The Night Manager — but involves putting the newspaper to bed rather than guests. Just over a week to go and then Flack's Last Shift is unleashed on a world that is as unsuspecting as it is indifferent. That sounds self-defeating but, in fact, it is the best way to gear up for having a novel hit the streets. I.e, as good old Seneca tells us: expect the worst, and then anything else is a pleasant surprise. I've tried surfing in high heels many times, but I've just never been convinced that it's practical. Maud le Car would beg to differ. Suitably inspired, I'm tottering down to the beach, surfboard under arm, to try again.